After William Morris died, May and her mother, Jane, continued to live at Kelmscott Manor. It is unclear when May first had the idea of erecting a village hall as a memorial to her father. 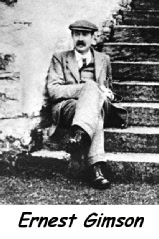 In 1914, following her mother’s death, May commissioned Ernest Gimson, a prominent architect of the Arts and Crafts movement and a disciple of William, to design Manor Cottages in memory of Jane. May’s plans for a village hall were first mentioned to the village Parish Meeting in January 1919 during a discussion about a memorial to villagers who had lost their lives in the Great War. A reading room was proposed “but as it was found that Miss May Morris had a scheme in hand for erecting a Village Hall in memory of William Morris, it was thought that the building of a reading room would not in this case be necessary”. 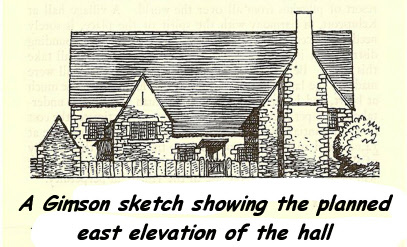 Gimson, himself, died later that year having already produced several sketches for the design of the hall. His pupil, Norman Jewson, then took the project on. May Morris did not begin fund raising in earnest for the Memorial Hall until 1928. She was aiming at an opening date in 1934 to coincide with the centenary of her father’s birth. 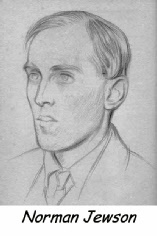 During the intervening years she worked tirelessly to raise money for the proposed project described in her Appeal Leaflet of 1928 ‘beautiful in itself and useful to the place that was so much a part of his life.’ The appeal leaflet targeted friends, scholars, politicians, and writers including such notables as George Bernard Shaw, Rudyard Kipling and Ramsay McDonald. It was even circulated in the US where Harold Pierce who had met May during her lecture tour of 1909 asked for 550 leaflets to be distributed through the Grolier Club in New York. 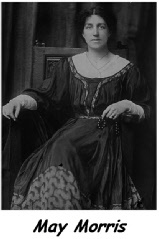 May was a talented embroidery designer and was in charge of the embroidery section of Morris & Co at the age of 23. She used her skills to raise money through the proceeds of lecture tours and by selling numerous embroidered place mats for £1.00. Building work was begun later that year by a local builder, King of Lechlade, on land donated by Lord Faringdon. The stone came from Sir Stafford Cripps's quarry at Filkins. Brick was used for the internal walls and to line the external walls. The roof was covered in Stonesfield slates, the timber was felled locally and the ironwork made by John Print of Langford. Jewson’s final design for the Memorial Hall omitted the long north­-south corridor and the planned gable chimney on the east elevation. The L shaped building now consisted of a long hall, with a stage at one end having storage and a boiler room below; it was accessed from the outside by double doors in one corner. The main entrance was in the shorter arm of the L which housed a games room with a reading room above. Two toilets were located to the north of the main building and the yard between them was covered over to provide bicycle storage. Within the building, the main hall was left open to the roof to expose the whitewashed timbers and dado rails, that incorporated wooden window seats, protected the lower walls. The fence adjacent to the road, as Gimson designed it, used a local method of enclosure consisting of large flat stone slabs set vertically into the ground with iron restraining posts. The method was commonly used in pig-sty construction as it prevented the pigs from working the mortar loose as they would in a conventional wall. The Morris Memorial Hall was officially opened by George Bernhard Shaw on Saturday 20th October 1934 at 3 pm. The organisation of the proceedings was in the hands of Mr Robert Hobbs, a prominent Kelmscott farmer and the newly elected chairman of the council of trustees for the hall. The event was of such importance that it received coverage in both the National and local press. The coaches and buses that were laid on to connect with trains from London, filled the field behind the hall. It was so crowded that Prime Minister, Ramsay McDonald, who arrived unexpectedly to hear Bernard Shaw, had to listen to his speech through an open window. Later, having managed to find his way onto the stage, MacDonald proclaimed: "This hall is just the sort of thing that Morris would have liked to have founded. It will not only be a local place, it will be a centre, a point, for world pilgrimage. I am glad to be here and feel the spirit of Morris." Following the ceremony, teas, at 1 shilling each, were served at the Manor to around 300 people with Miss Lobb, May’s companion, in charge of the urns. The hall today is an unassuming stone building that blends well with its surroundings and the older stone-built houses in the village. Although some changes have been made to the use of the rooms, a modern kitchen has replaced the games room, it still retains its original architectural features. It is indeed a fitting memorial to William Morris and continues to be used, as his daughter intended, as a focal point of village life. Sadly, the £1000 bequeathed by May Morris for the long term upkeep and maintenance of the hall has long since been exhausted and income is now sourced from fund raising events by the village, hire of the hall itself, donations and grants.